If you really like fresh and crusty bread, then I have just the thing for you. I have seen this recipe popping up on some random food blogs and I was intrigued and decided to give it a try. It is surprisingly easy to make and so I won’t have any steps pictures for this. All you need is cast iron pot with a lid and you can make outstanding bread in no time, well the process is not that fast though but the result is simply amazing. 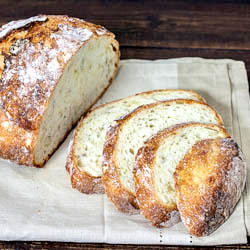 I have been baked bread for some time now and this is by far the best approach for the novice baker and it will definitely beat everything that comes out from your bread machine, both taste and texture. Anyway start by getting your dough ready as you do for any other bread, simply mix the flour, salt and yeast together and then add the water. Mix using a wooden spoon or spatula until it’s all incorporated, no need to over mix, it will look like a sticky mess. Cover up the bowl, let it rest outside on the counter for 12 to 18 hours. Sorry no bread for you the first day also make sure you don’t refrigerate either. After so many hours the dough will rise and dough will become more consistent. Fire up your oven to 450° F / 230° C and preheat your cast iron too for a little bit. When the pot is hot get a lot of flour on your hands and shape your dough into a ball, then drop it into the pot. Put the lid on and bake for 30 minutes then remove the lid and bake for another 15-20 minutes or until it is nice and golden brown. If you want to go nuts and add herbs and other things to your dough you can definitely do so. In a big bowl mix flour, salt and yeast together. Pour water into the bowl and using a spatula mix it until it's all incorporated. Cover the bowl with plastic wrap and let it sit on your counter for 12 to 18 hours. Preheat oven to 450° F / 230° C. Add your cast iron pot to the oven and heat it as well. Flour your work surface really well and make sure you flour your hands really well. With your floured hands gently remove the dough from the mixing bowl and roughly shape it into a ball. Take the ball of dough and drop it into the heated pot. Cover the pot with the lid and place it back in the oven. Can you use a pot that isn’t cast-iron for this? I would love to try this recipe, but don’t want to go buy a cast iron pot just for the occasion. I have no idea but I guess there is only one way you can find out. I am thinking cast iron gets very hot by comparison and there is also an even distribution of heat, this would probably make all the difference. I’ve made this bread hundreds of times and a good tip is to sprinkle some corn meal on a large piece of parchment paper then put your shaped dough on it and drop the whole thing in the dutch oven. You can then lift it out by the paper when its done and it has a nice crusty bottom. I guess that would work too. I love bread recipes like this! it looks fantastic. Thanks! We abused the recipe for about a week here but we got bored at some point and started trying other recipes. If you want to have this type of bread the same day …. 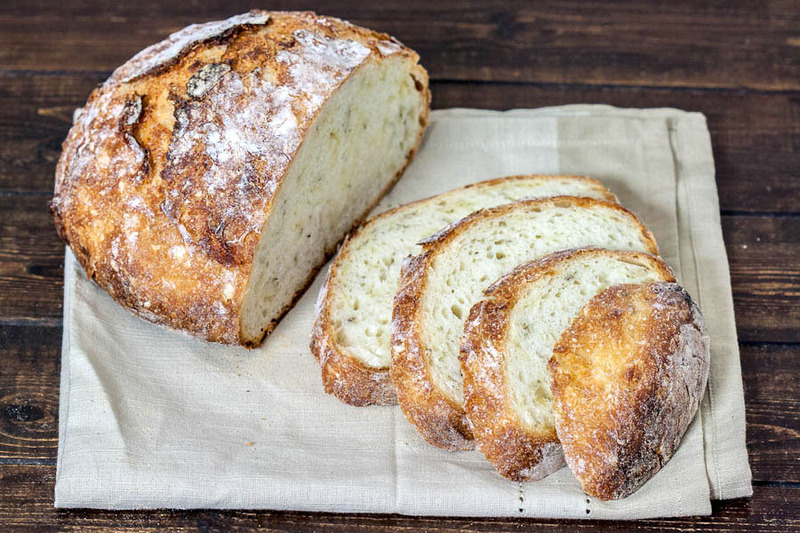 use Mark Bittman’s “no-knead” bread recipe. The recipe is the same except you use the rapid rise yeast…and the dough only has to rise for about 4 hours. I know when you let it rise longer that the gluten gets “more formed”. I am not a bread baking expert, but I make the “no knead” bread all the time. It always comes out perfect..and is delicious. Thank you for posting this longer version…someday I will have to try it. I tried this bread recipe today! Just as you promised, it turned out great! It even looks like the picture you posted. This was my first foray into baking bread from hand and it was very, very easy. Thanks!! I do have a couple questions- do you know what time/yeast/other adjustments would have to be made to double the recipe? And do you know if anything would be majorly different if I used rye/wheat flour? Thanks a lot! Well when you start modifying recipes sometimes you get unexpected results and not always in a good way. However you might end up making something amazing so I think you should definitely give it a shot. Unfortunately I cannot give you an answer to your questions, not until I try something similar myself. Still, you can always make it twice. Hi, thanks for this recipe! It was super easy and tasted amazing. I followed it to the letter and it turned out good and I’m a novice baker. My only issue was that the bread stuck to the bottom of the pan. Your recipe doesn’t have any instructions to grease the pan with oil or butter prior to putting the bread in it. What would you suggest I use next time? And do you suggest greasing before or after preheating the pan? Hi, I did not grease the pan and if your bread got stuck I am thinking of two possibilities. 1) you did not use a cast iron pan and/or temperature was too high and 2) there was not enough flour on the bottom of the dough when you dropped it inside the heated pot. You could try some cornmeal but I am not sure how that would work. Hi. There is no mention of kneading the dough in this recipe. Most bread doughs benefit from a lot of kneading – the more the better. What about this recipe? Thanks. This one does not require kneading. Give it a shot and you will see what I’m talking about. The thing is so easy to make and it is so delicious, I was simply amazed the first time I made it. Great recipe! Would the instructions still be the same if I used a pizza stone to bake it? Honestly I have no idea. I assume it will burn pretty fast, notice that you have to cover it for some time. Is that 3 cups of sifted or unsifted flour?